It’s a beautiful sunny morning, and even though it’s only half past six, it’s warm enough to be picking strawberries in my pyjamas. Things are getting back to normal – the temperature is at last catching up with the month – and yesterday, I actually played table tennis outside with Dave. It’s so long since I had a bike ride on the Monsal Trail, but I’m hoping that today’s the day. The current problem is this: at present my adaptation of BUT I TOLD YOU LAST YEAR THAT I LOVED YOU is four one hour episodes, finishing at the end of the book/story. My mentor says that I should not be tying it up so neatly, in case they want another series later. So, dear readers who have read the book, where precisely do you think the adaptation should end? e.g. where Fran arrives wet and exhausted on the doorstep of the Northumberland cottage and Sol opens the door to her? Speak up, I need your help. I was reading stuff about Greece on Twitter this morning and came across something wonderful: a Greek crowdfunding site raising money to support refugees arriving by boat on the shores of Lesvos, Chios and Kos. They are fleeing war and terror in Syria, Libya, Iraq and other places, and a group of local people are providing them with hot meals and basic supplies when they land. The locals have been supplying these needs from their own resources, but now they are asking for help from others. You can read more about this wonderful project here. So now we have at least two ways to help these people torn from their homelands by violence and horror. We can support Médecins Sans Frontières, who man boats to rescue and give medical care to refugees traversing the Mediterranean, and we can help to provide basic supplies for them when they land… Here. Do you remember how upset I was about the plight of the people fleeing war, terror and starvation by sailing across the Mediterranean in tiny boats? And how I didn’t know how I could help them? Someone is helping these refugees. I found out yesterday that MSF mans two rescue boats in the Mediterranean, in partnership with Migrant Offshore Aid Station. MSF works in many countries all over the world, including Syria. Click here for their promise to donors. This is me with my best friend Mary, sitting in her back garden 7 years ago. Mary’s husband John took the photo. This is me sitting alone on her bench at the park yesterday. The unfortunately placed paper cup behind my feet was my empty cuppa. I was so nervous I was going to spill the tea on the beautiful bench that I put it on the ground and forgot about it, and John had Mary on his mind, not paper cups. The telling detail. 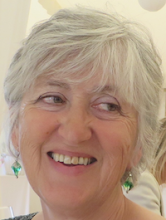 She was such a treasure, and no-one will ever fill the gap she has left in my life. I know I promised you some pictures of my garden. But this is my third week of feeling under par, and when I took the pictures this morning (in my pyjamas) the pictures turned out to under par as well. However, I am pleased to report that my precious sweet peas are looking perky. And we are going to have a bumper crop of strawberries this year. This is what it looks like when the Israelis demolish the home of a Palestinian family. There are so many cruelties and injustices happening here and round the world, but I confine my politics to Twitter, except for one issue: the oppression of the Palestinian people. Imagine you and your family had lived in a village for as long as you can remember, and the village had ownership papers for the land. Then imagine that the High Court ruled someone could demolish your village, take the land and leave you homeless. On Monday, May 4th, the Israeli high court approved a request by the Israeli authorities to demolish the tents and homes of Susiya, leaving 450 villagers homeless. Click here to see photographs of the village. The Israeli authorities are planning to demolish the village very soon (they visited it last week) and hand over the land to illegal Israeli settlers. The families of Susiya will be left homeless in harsh desert conditions. The Israeli government is also working on plans to forcibly transfer as many as 7,000 Palestinians from 46 communities in the West Bank, in some cases to make way for more illegal settlements. These transfers would be in violation of international law and represent a breach of the Fourth Geneva Convention. Please will you write to your elected representative and ask your government to speak out against this cruel injustice? UK citizens can find their member of parliament’s email address by googling it. Next blog post I’ll show you my garden. Until then, please consider writing. You can use this letter below. Copy, paste and email. It will take a few minutes. You will need to include your name and postal address. I am contacting you as your constituent to ask that you write urgently to the Foreign Secretary, Philip Hammond, to express my deep concern about developments that have taken place in the last week regarding Israel’s plan to demolish the entire village of Susiya in the southern West Bank. At the beginning of May 2015, the Israeli High Court refused a petition for a restraining order against outstanding demolition orders in Susiya. The refusal means the Israeli Civil Administration is now able to implement outstanding orders against the entire community. 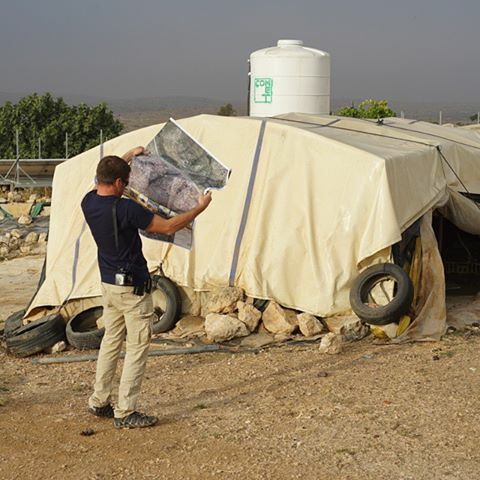 On June 16, Israeli officials visited Susiya to map the village ahead of its demolition. Based on past experience, local residents fear this means the Israeli authorities are planning to demolish the village in the near future and hand the land over to illegal Israeli settlers. Once this has happened, the families of Susiya will be left homeless in harsh desert conditions. Alongside this, the Israeli government is advancing plans to forcibly relocate as many as 7,000 Palestinian Bedouin from 46 communities in occupied Palestine. The UN Secretary-General has stated that the Israeli government’s implementation of this relocation plan would amount to individual and mass forcible transfers and evictions, representing a grave breach of the Fourth Geneva Convention. The plan includes transferring Palestinian communities from the politically sensitive “E1 area” in order to expand the illegal settlement of Ma’ale Adumim. Such a move would destroy any chance of a viable Palestinian state by effecting cutting the West Bank in two. Despite strong opposition from the international community, the Israeli government has taken a number of steps recently to advance the plan, including starting work at one of the sites to which Palestinians will be forcibly transferred and appointing a retired General to liaise with affected communities and oversee the transfer process. The situation is urgent. Please write to Philip Hammond to raise these concerns and ask that the UK issue a public statement and call directly on the Israeli government to immediately freeze all settlement activity and demolition orders, and cancel all transfer plans. My novel IS quiet. I realise that fully now that I am trying to keep the errant viewer from switching to another channel because nothing is happening apart from Sol sounding off and being hilarious. So watch out when the story hits your TV screen – one of the extra plot points could well be an emergency dash to hospital. Eat your heart out, Sally Wainwright. I think, perhaps, I take fiction too much to heart. If a book or film speaks to me and draws me into its world, I care too much about the people in it. Then if there is a sad conclusion, I am sick at heart. Sometimes if a book is too depressing I stop reading it, no matter how beautifully it’s written. I’m looking at you Marilynne Robinson, Per Petterson, and the man who wrote that dreary book Stoner (whose name I have obviously repressed and can’t be bothered to look up now.) Call me a philistine. I really don’t care. Life is sad enough without immersing myself in fictional miseries. Do you like sad books? I’ve just read Pontoon by Garrison Keillor and I loved it. It was classic Keillor, and it cheered me up immensely. It made me forget I was feeling rotten. Then I read Our Souls at Night by Kent Haruf. I read it despite the fact that it wasn’t available in paperback and despite the fact that Haruf eschews quotation marks. I read it because of this review. I couldn’t not. How do you feel about quotation marks? My heart sinks when I open a book and there are none. Why do authors leave them out? I would like to discuss it with one of those who practise this abomination. For me, it interferes with effortless comprehension, and it makes the words on the page a depressing sludge. Despite the lack of quotes in Haruf’s book, I commend it to you. It is beautifully written. Yes, it has a sad ending, and because I was reading it on Kindle and wasn’t aware that I was on the last page, it took me by surprise and hit me in the gut. But the book is an exception that proves Hepworth’s rule: despite the lack of quotes and despite the sad ending, I shall read it again. That’s how much I liked it. I’m on my third diagnosis and the antibiotics prescribed yesterday are kicking in. My laptop is back on my desk and not on my bedside table, although for the first three days of being ill I couldn’t write anyway. I realised I was getting better when I managed to come down the stairs without holding the banister rail. And on Friday in the kitchen I found myself doing three things at once (as per usual) so I knew things were looking up. Crikey, I’ve been feeling sorry for myself. I couldn’t eat and I can NEVER not eat. Friends emailed and said “I hope Dave is looking after you.” For the record, Dave always looks after me. She explained she had written her name on Cecilia’s foot so Isaac and Wendy would know who had done the decorations. There is a back view because she was particularly proud of the artwork on the nappy. and I was too unwell to go and give him his present and have some cake, so I rang him up, feeling sad, and he turned to Zoe and suggested she should save some cake for me. Then later he Face-timed me to show me his presents. I’m sorry not to be blogging this week, but I’m ill.
My friend Heike invited me to go to Manchester with her to what was billed as a “peace flash-mob” outside the central library at rush-hour. It was organised by Buddhists and Quakers. It was silent. Most people knelt and meditated for half an hour. I stood stock still and silent, holding a banner. Passers-by – of which there were many – seemed generally very interested. Many stopped to watch for a while. Were they getting into the spirit of the thing? or were they waiting for something to happen? At last there was an evening warm enough, dry enough and still enough for Liz and me to walk down the Monsal Trail and sit on the terrace at Hassop Station to eat. I hope it will be the first of many this summer. You may have intuited from the lack of mentions of food on this blog that I don’t like cooking. You’d be right. I used to like cooking. When we had two teenagers and a toddler at home I was always trying different recipes. I even invited people here to eat. And some people think I’m a really good cook. But after so many years of being a mother, I have definitely shot through my cooking phase. Now I do the bare minimum. Yesterday, though, I got home from a coffee with a friend and a visit to Zoe’s, both of which cheered me up so much that as I parked the car in the drive I thought – Hmm, there is some halloumi open in the fridge that needs using up, and I have some left-over (home made) red lentil dhal in the freezer, so if I whip up a potato and mushroom curry quickly and make cous–cous (a 2 minute job) I’ll have a really nice tea. Yes! So I swept into the kitchen, side-stepping Dave’s requests for an extended update on my day, and launched into making the mushroom concoction. This was in full swing when I delved into the freezer and found NO red lentil dhal. Why had I thought I’d seen some there yesterday? I really must start labelling food in the freezer. The upshot was that I had to make something else to make up the meal. Isn’t food boring? Why is it plastered all over the weekend magazines and all over the TV schedules? And is it any wonder that there is an obesity epidemic? I love good food. I love eating other peoples’ cooking. I just don’t want to spend time making it myself when there are so many more interesting things to be doing – writing, playing the sax, photography, walking, cycling, playing with grandchildren, talking to friends, laughing, sewing, knitting, watching old episodes of Due South with Dave, reading articles about how to write a successful screenplay, etc etc etc. And in the absence of an interesting photo of food, here’s one of my laburnum coming out.